When the lovely Sarah Stiller from Neenah Paper told me about the Oxford & Esse clock design contest, I knew I would never meet the deadline (24 hours). Still, this fun promotion is something I had to do something with, so I ordered my paper anyway. Confined at home by the icy world outside, I woke up determined to make my clock. The image shows the time at 2:40+. For the clock face I used Esse, Pearlized Latte with hours and minutes punched out. The orange hour dot is Esse, Arancio. The background is Oxford, Black. I called it Moon Shine because the design kind of remind me of moon moving in its phases. Although my design is nothing like what people made, next time when I get a big break, I might just come up with something else! 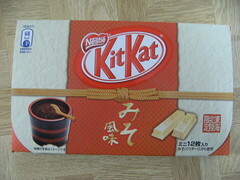 I’d love to meet the marketing genius for Kit Kat in Japan! On NPR’s “The World” today, they talked about Kit Kat having 200 kinds of flavor in Japan, like ginger ale, bake potato, egg custard, green tea… And some are seasonal or region specific (for the tourists, the strangest one might be the Miso flavor), as many other Japanese products are. Other than the blinding variety of flavors, what made Kit Kat a sure win brand in Japan? Kit Kat’s slogan there is “Kitto Katsu,” which means sure win (きっと勝つ.) They even had a mailing ready packaging for people to send to students who are in need of some luck before exams. Wow, way to push products. I am in awe of this brilliant idea! Nail Thru The Wall, in An Art Museum?! As I was pounding a nail into a wall in the Seattle Art Museum, the mixture of inspiration, creativity, guilt, rebellion, liberation, and pure fun filled my crazy little head. To this piece of art by Yoko Ono (part of the Target Practice: Painting Under Attack 1949–78 exhibit), I donated all the good sayings from fortune cookies. Since they haven’t came true for me as they lived in my wallet, I thought maybe if I shared them with all the visitors, some things are bound to come true for some people. Other than seeing what other people pull out of their pocket to put on the wall, it was interesting seeing people digging through what they have to contribute to this piece. What interactive fun! And when you visit, would you get yourself a good fortune? It is my gift to you. The quietness is what draws me into Edward Hopper’s world. When the curator said Hopper was inspired by people watching, I was intrigued. He hid in plain sight, took mental photographs of people’s appearances along with the emotions Edward observed in them. In his paintings, he was showing people in new social situations, where women were starting to work and dine in restaurants. He was quietly telling you the stories of his time. Isn’t that much like what a writer would do with images and words? No wonder I like his paintings. The silence of them shows me his position strictly as an observer. The tranquility of them tells me to observe with imaginations. The simplicity of them teaches me to tell a story rooted in reality. As a contemporary of the modern women he painted, I will keep on watching under the invisible cloak of busy crowds. Question on blogging? I got my answers at the Blog Bling Mixer. Right before the mixer, I spent the whole day building a new blog for my creative writing group, then I ran into the wall of Widgets. I have always wrote my own templates so I can tailor each blog to the client’s specific needs, now I want to know how widgets can help me save work and time. Last night, Jason Preston of Parnassus Group (event host) explained it to us. Widget in sidebars: Think in boxes, each is a tool to display data of your choosing. Also see Jason’s Blog Bling tip on styling your custom sidebar. Widget in WordPress admin design widget page: Think “Widgetry”– a tool to help you build in blocks. WP widget function help you add and arrange your sidebar widgets without programming. We also learn other tips. I have so much in my head now, I can’t wait to get them all out on the new blog. It was a great event to learn and met bloggers of all kinds. When is the next one?! Sign me up! As adults we know what kind of a learner we are. You often hear people say, I am a visual person or I do better with audio books. For children, they don’t really know. As parents, you want to give them all the options to help them learn while they figure it out. Here is where Write Way To Learn multi-sensory learning cards come in. My friend Angie Sharp from Bainbridge Island, a brilliant artist and a lovely person, came up with this idea to help her children learn. Not being a parent, the part I like the most about these cards are that kids see actual image of objects, not a cartoon version. These card are interactive in so many ways. You can even customize the cards for your children, making the cards relatable and relevant. Take “My Family” set for example, why should your kids to point at a photo of a strange person and learn that is Mom or Dad? Put your own photo on the card and cut out the confusion. With the “My World” set, you can use the photos of their favorite toys and places. Would it be fun for you and your children to have a photo session or pick out the photos together? For your eco conscious folks, printable cards are also available for download. That means no use of fossil fuel. If you would rather have a ready-made set, the cards are printed in USA, on recycled paper. Even the tote bags are made with recycled materials. Since I am not a parent, I will stop here so you can actually go explore the Write Way To Learn. I am the luckiest girl in the world! Miss Lady made me a custard pie! Hazel (Miss Lady) at My Sisters’ & Me is one of my clients. You might think my view is bias because of that. If you don’t know me, I don’t joke about good eats. Let me tell you about Miss Lady’s Egg Custard Pie. The custard is firm like the cheesecake yet light and refreshing. The crust is flaky with just the right thickness to make a crust loving girl happy. My perfect bite consists of the fragrant custard and the flavor infused pie bottom, the sweetness of the filling and the pie dough taste better with every chew. Every bite is precious to me so it always takes me a long time to finish a piece. While I was taking pictures of the pie, I wished I was a good enough photographer to capture the goodness in this pie. So, don’t judge the pie by this photo. If you like egg custard pie, call Miss Lady! If you like a honest homemade dessert, you really should call Miss Lady! One more thing to mention about helping our flooded Neighbors, if you would like to help them directly, please visit the Donation Coordination page and find out what they need before you prepare your donation. Tzu-Chi is already part of the coordinated assistant effort.